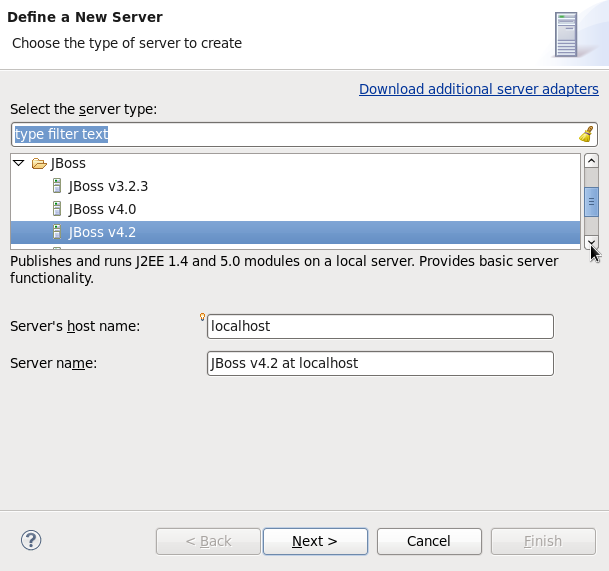 JBoss application server is a server which offers Java Enterprise Edition services to web applications authored in Java language. 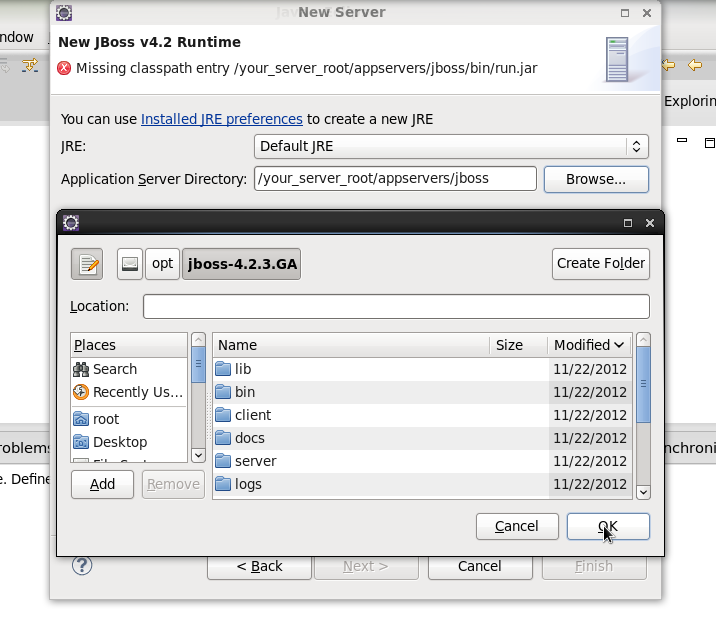 Download JBoss server from here. 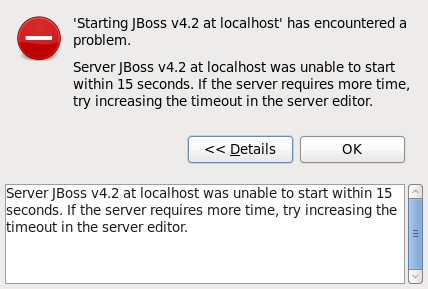 I have chosen the 4.2.3 version of JBoss server to download. Extract the downloaded compressed file to a suitable location. I have extracted the file to /opt. On Eclipse, go to Servers view. If you do not see Servers view, go to Window > Show View > Other. On the Show View window, choose Server > Servers and click OK.
Click on new server wizard or right-click and choose New > Server. 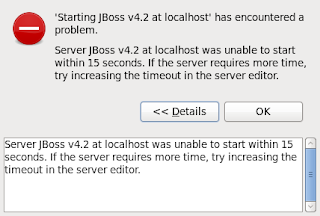 Choose JBoss > JBoss v4.2 and click Next. To set the Application Server Directory, click Browse or type the path to the extracted server folder in step 2 and click Next. 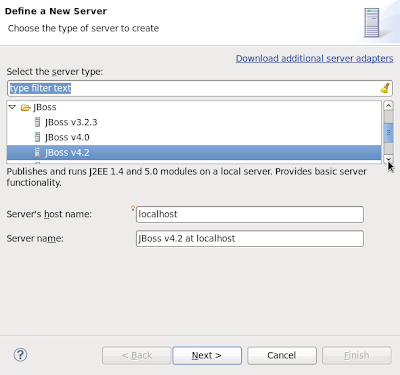 Choose address, port, JNDI port and server configuration and click Next. I have left it as default values here. 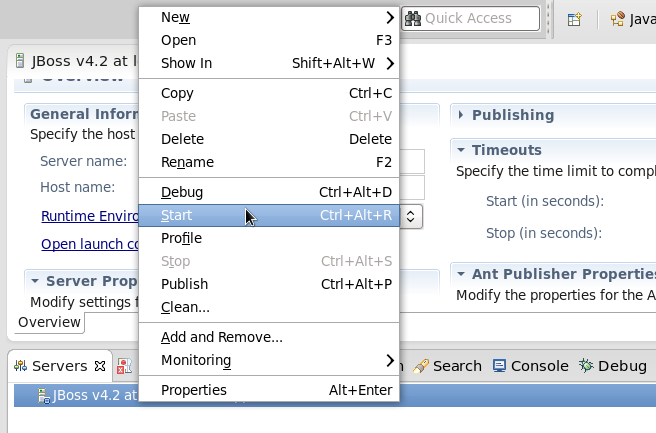 If you have any web application to be set to run on the server, add them and click Finish. You will find the server being listed in the Servers view. Double click on the server listed in the Servers view or right-click and choose Open. The server can be configured in the window opened up. 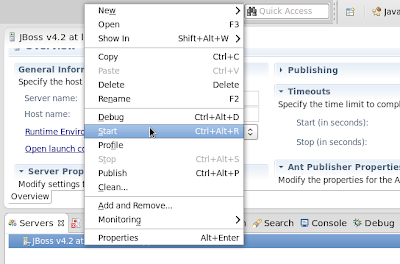 Expand the Timeouts section and modify the Start and Stop values. These are the values in which the server has to start-up or shutdown as monitored by Eclipse. You may need to increase these timings, otherwise you will end up with an error saying server could not be started as displayed below. Once done, save the configuration from File > Save. Right-click on the server from Servers view and choose Start. Monitor the Console view to see if the server has started successfully. Test the server from browser by going to the host name and port configured.